Constantine VIII was the Byzantine Emperor from 15 December 1025 until his death in 1028. 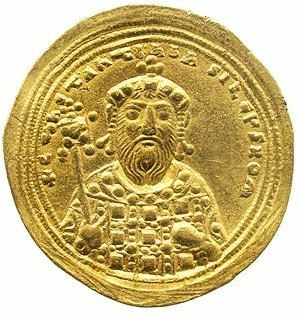 He was the son of the Emperor Romanos II and Theophano and the younger brother of the eminent Basil II, who died childless and thus left the rule of the Byzantine Empire in his hands. Basil died childless on 15 December 1025 and Constantine became sole emperor as Constantine VIII. He was sixty-five and a widower. He had been a co-Emperor for sixty-three years but had always been content to enjoy the privileges of Imperial status, without concerning himself with state affairs. He spent his life in the search of pleasure and entertainment or amusing himself with riding and hunting. He was "of frivolous disposition, he desired nothing more than to pass his life wallowing in extravagant pleasures." Constantine carried on as he always had – hunting, feasting, and enjoying life – and avoided state business as much as possible. He ruled for less than three years before his death on 11 November 1028. Like his brother, Constantine died without a male heir and the Empire passed to his fifty-year-old daughter Zoe, whom he had married to Romanos Argyros. Constantine had forced Romanos to divorce his wife and his marriage to Zoe took place only three days before Constantine died.